“Dormitando” series gravitates around the Puerto Rican condition of being on a sleepwalking state. The landscape lends itself as a representation of the colonized psyche; levitating towards a resolution that never seems to come. Through video-installation and performance documentation I explore the abandoned space and the natural space juxtaposing them, presenting what was before being occupied and the possible condition that awaits the natural landscape. In this manner, the body stays half-asleep with a soul that longs to walk and navigate the diverse sites. The prioritization of the privatization of specific landscapes becomes a source of income for the elitist groups, but among the promise of improvement for the sites, the "ideal" solution leads to the sale of the land. The privatization of the Puerto Rican landscape requires an instrospection that becomes a reminder of the struggle of the Puerto Rican's crisis of identity. The work reprsents the acquisition of land as one commodified product of the colonial discourse, that also nourishes the seed of acculturation among the colective mindset of the population. Site I Caimito, Puerto Rico is the place where I grew up, at my grandmother's house, where my childhood unfolded. The rural landscape was very present in my life since an early stage and I've learned to understand its difference from the cityscape, its potential and how many resources are loss because there are no hands willing to work the land, yet plenty of hands to pollute it, and give it away for others to profit from it. I found a vast connection between the privatization of the landscape and how I, as a woman, feel and behave under society's imposed gender construct. The found objects in the site lend themselves as an entrapped spider web that my body occupies in the state of being half-sleep. Site II Castillo Villa del Mar, Naguabo, Puerto Rico, is where the remains of the historic Victorian monument in ruins exists. This place evokes a present reminder of the axis of commerce during the Spanish colonization in Puerto Rico which is located at the shore of the Caribbean Sea. In it's borderline the structure acts as a vivid reflection of the Island's past and present economy, from one colonization to another. Site III El Yunque, Puerto Rico is a tropical rain-forest protected under the Natural Reserve, yet one of the most visited landscapes in Puerto Rico as an attraction among tourists. Árbol caído in El Yunque represents the disappearance of the Puerto Rican natural landscape, it stands for the rest of the spaces that are not protected under the same laws and that currently find themselves under the circumstances of being sold to pay-off the government's questionable debt. Nature falls apart, while the socio/political/economical crisis increases. 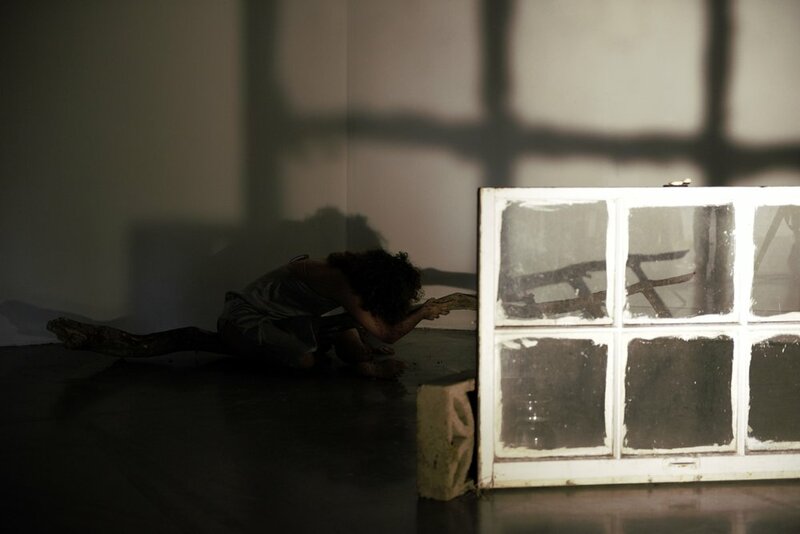 I interacted with the audience imposing the forced gaze, evoking the question of what is in the other side (of the window), how do you look at it and what is understand of it. At the end, I am encountered with the shadow of the window, and where it seems to be no door I break free.